Plot, Inner Change, Evocative Writing—What Really Rivets Readers? © Written content is the intellectual property of JADD Publishing (Angela Ackerman and Becca Puglisi). Do not distribute w/o written consent of copyrighted parties. Please note this website does use affiliate links. –The words you choose can convey atmosphere and mood. –Similes and metaphors create strong imagery when used sparingly. Setting is much more than just a backdrop, which is why choosing the right one and describing it well is so important. To help with this, we have expanded and integrated this thesaurus into our online library at One Stop For Writers. Each entry has been enhanced to include possible sources of conflict, people commonly found in these locales, and setting-specific notes and tips, and the collection itself has been augmented to include a whopping 230 entries—all of which have been cross-referenced with our other thesauruses for easy searchability. So if you’re interested in seeing a free sample of this powerful Setting Thesaurus, head on over and register at One Stop. On the other hand, if you prefer your references in book form, we’ve got you covered, too, because both books are now available for purchase in digital and print copies. In addition to the entries, each book contains instructional front matter to help you maximize your settings. 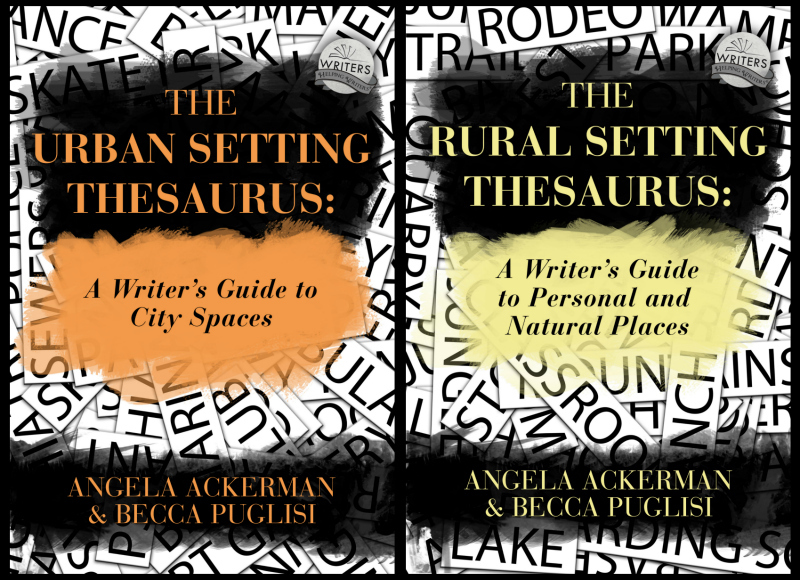 With advice on topics like making your setting do double duty and using figurative language to bring them to life, these books offer ample information to help you maximize your settings and write them effectively. Angela is a writing coach, international speaker, and bestselling author who loves to travel, teach, empower writers, and pay-it-forward. She also is a founder of One Stop For Writers, an online library packed with powerful tools to help writers elevate their storytelling. I’m not a big mall person. I always feel, particularly in the BIG ones, that I’m in some kind of futuristic self-contained city where humans live and work and never get outside because no one can live there anymore. The other thing is I get overwhelmed by all the STUFF! Yuk. Wow, you captured it well, really well. I work in a mall office and I’m there 5 days a week… nice job! I am so impressed at how thorough you are with your lists. Don’t ever quite blogging! I can’t live without your site. Seriously! It might be a UK thing, or maybe just a throwback to when I used to frequent shopping malls as entertainment, but I always remember the clammy feel of the hand-rail on the escalators. How it would be moist when the temperature was high, giving it a tacky feel. I used to get into SO many scuffles at shopping malls in the summer. I’ve got some gift cards from Christmas burning a hole in my pocket. I’ve been to busy to go though. Yes, please add me to your mailing list.